I have a few inexpensive but super sparkly costumes for sale here! 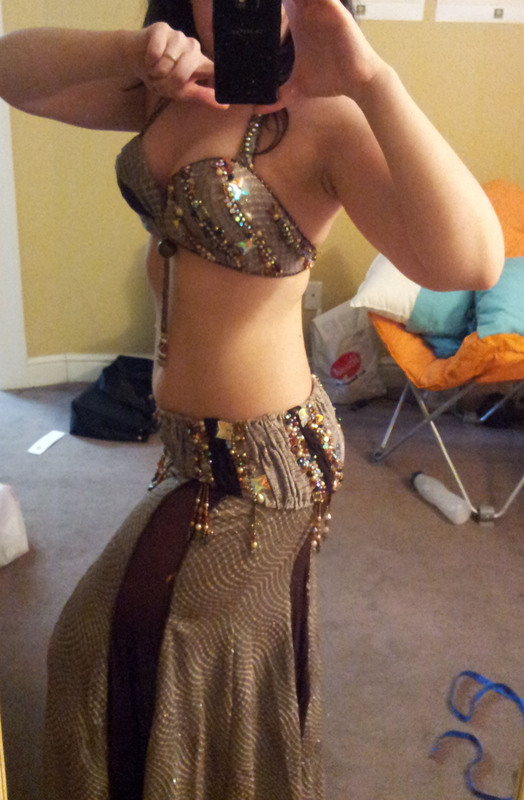 Reminiscent of a Sahar, this super sparkly costume is a study in simplicity! The farbric is stretchy red metallic and it comes with bra, skirt iwht single flower ornament and slit over left leg and two gauntlets. 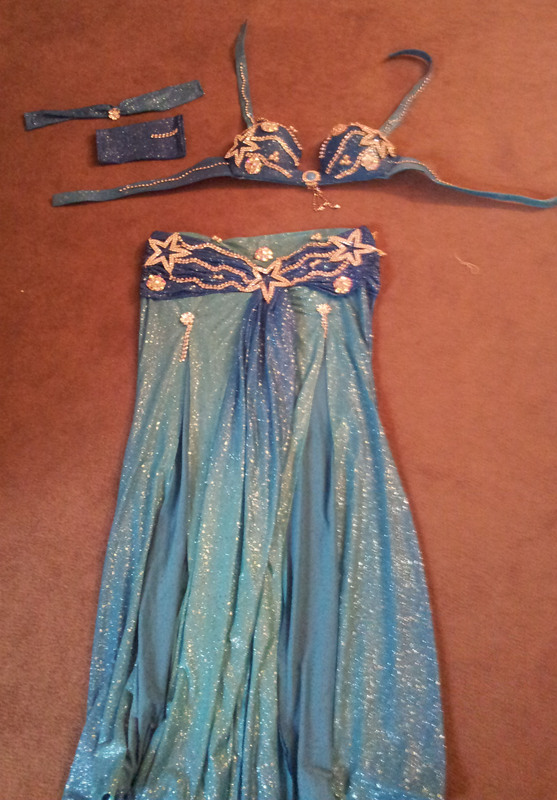 Beautiful Eman Zaki costume that comes with bra, belt, two arm bands, and skirt. The skirt has a front center slit and is incredibly twirly. See the video below for the twirl factor! 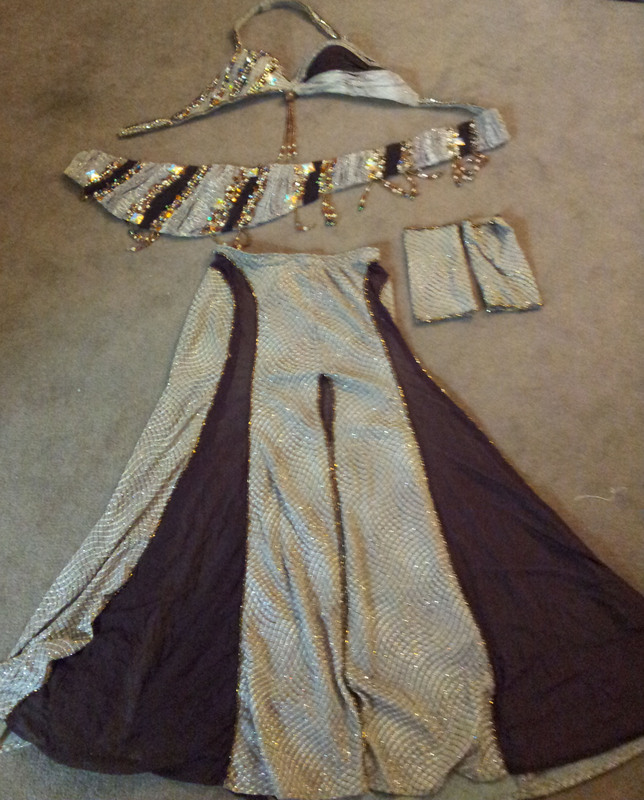 The costume has been loved but has plenty of sparkle to it. It is by far one of the most comfortable cosutmes I have owned! Belt is 35″long measured at the top of belt. Skirt is 26″unstretched at the top and stretches to 40″. Comes with two arm bands. Elegant turquoise gyptian bra and skirt set is a study in grace. The skirt has two front slits so it shows a lot of leg and comes with two armbands. The fabric is sparkly and is studded with rhinestone ornament. Skirt is 28″unstretched at the top and 34.5″stretched. The skirt is 37″laying flat. Comes with two arm bands. Id like to buy the turquoise Egyptian from you… If you can email me or call me if appreciate payment details. hi, turquosie eman zaki are also avaible? Sorry all sold! Thanks for looking! I will be selling more soon! hi, please if you have any eman zaki costume send me e-mail. thanks very much!!! Hi Marika! I just sent you an email! Previous PostPrevious Around the World with Dance! Next PostNext Recap: A March weekend with Lisa Zahiya!